One of America's most prolific actresses was born Doris Mary Ann Von Kapplehoff on April 3, 1922, in Cincinnati, Ohio. Her parents divorced while she was still a child and her mother gained custody. Like most little girls, Doris liked to dance. She would sometimes dance with friends and, sometimes, just by herself. She had dreamed of being a ballerina, but an automobile accident ended whatever hopes she had of dancing on stage. It was a terrible setback, but after taking singing lessons, she seemed to find a new vocation, and began singing with local local bands. It was while on one singing engagement that she met Al Jordan, whom she married in 1941. Jordan was prone to violence and they split after two years, not long after the birth of their son Terry Melcher, who later became a record producer. In 1946, Doris married George Weidler, but this union lasted less than a year. Day's agent talked her into taking a screen test at Warner Bros. The executives there liked what they saw and signed her to a contract (her early credits are often confused with that of another actress named Doris Day, who appeared mainly in B westerns in the 1930s and 1940s). Her first starring movie role was as "Georgia Garrett" in Romance on the High Seas (1948). The next year, she made two more films, My Dream Is Yours (1949) and It's a Great Feeling (1949). Audiences took to her beauty, terrific singing voice and bubbly personality, and she turned in fine performances in the movies she made for Warners (in addition to having several hit records). She made three films for the studio in 1950 and five more in 1951. In that year, she met and married Martin Melcher, who adopted her young son. In 1953, she starred in the title role in Calamity Jane (1953), which was a major hit, and several more followed: Lucky Me (1954), The Man Who Knew Too Much (1956) and what is probably her best-known film, Pillow Talk (1959). She began to slow down her filmmaking pace in the 1960s, even though she started out the decade in a hit, Please Don't Eat the Daisies (1960). Her husband, who had also taken charge of her career, had made deals for her to star in films she didn't really care about, which led to a bout with exhaustion. The 1960s weren't to be a repeat of the previous busy decade. She didn't make as many as she had in that decade, but the ones she did make were successful: Do Not Disturb (1965), The Glass Bottom Boat (1966), Where Were You When the Lights Went Out? (1968) and With Six You Get Eggroll (1968). Her husband died in 1968, and Doris never made another film, but she had been signed to do her own TV series, "The Doris Day Show" (1968). That show, like her movies, was also successful, lasting until 1973. After her series went off the air, she made only occasional TV appearances. Today, at 86, she runs the Doris Day Animal League in Carmel, California, which advocates homes and proper care of household pets. What else would you expect of America's sweetheart? 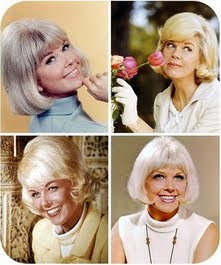 Doris Day's birth name is Doris Mary Anne von Kapplehoff (add an e to Ann). Don't know where you obtained her birth date, but I have always known it as April 3, 1924. Did enjoy your mini bio. Any more corrections then just let me know.Infact keep off my page! ..Doris von Kappelhoff was 7 years old when the census enumerator called on the 10th April 1930..making her birth year 1923..so who knows exactly? Presumably her actual birth is registered somewhere in the Cinncinati archives?